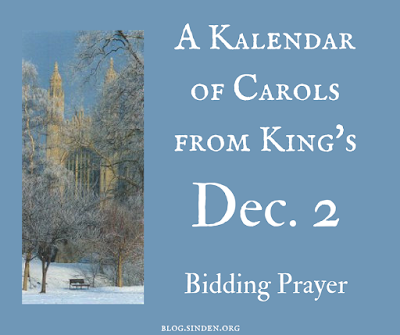 Sinden.org published its traditional preview of the music list for the Festival of Nine Lessons and Carols from King's College, Cambridge on November 24. Now, for the days leading up to the service, we'll offer a Kalendar of Carols: a more in-depth look at each piece of music to be sung. We began with the opening hymn. Today we continue with – not a piece of music – but the Bidding Prayer. Who does not love this prayer? Given that the hymn "Once in royal David's City" was not sung in the first year of this service (1918), this prayer may, in fact, be the oldest fixed element of the service. It was written by Eric Milner-White, then the Dean of King's.